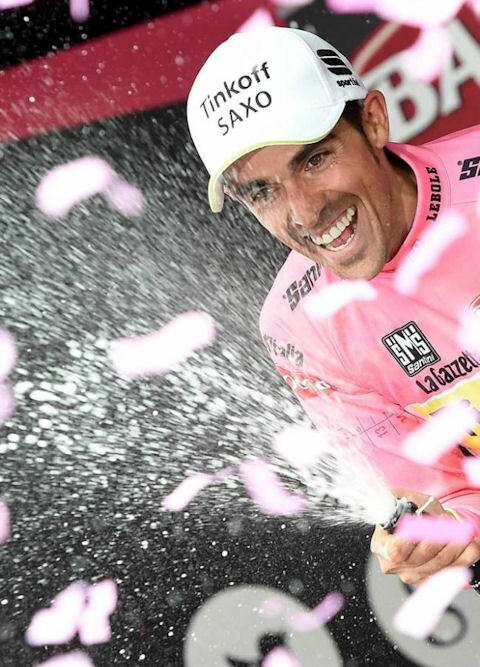 Alberto Contador won the 98th edition of the Giro d'Italia today after a 178-kilometer celebratory triumphal march from Turin to Milan. Alberto has now won a remarkable nine grand tours - three Triple Crowns: Tour de France 2007, Giro d'Italia 2008, Vuelta a España 2008, Tour de France 2009 and 2010, Giro d'Italia 2011, Vuelta a España 2012 and 2014, and Giro d'Italia 2015. His new total moves him to third place on the list of all-time grand tour winners, behind Eddy Merckx (11) and Bernand Hinault (10) and ahead of Jacques Anquetil (8). In post-CAS numbers he is tied with Miguel Indurain and Fausto Coppi (both with 7). Currently the reigning champion of two grand tours, this Giro and last year's Vuelta, Alberto will attempt to make it three in a row this July in France. There's a reception tomorrow, Monday, in Madrid and a celebration in Pinto, his hometown. After the fêtes, he'll take a day or two for rest, but in within a week, Alberto Contador will be at training camp preparing for the Tour de France. What’s your connection to the Mortirolo? My first memory of it is from 2008, when I came to the Giro on the back foot. I only had four seconds of advantage on Riccò, but I was able to hang on and stay in pink. In 2011 it wasn’t climbed. We’re talking about a climb that I like, really, really tough, where time gaps are taken. Coming the day after the rest day – and with all the climbs that come before it – will make it complicated. Will it be the most important obstacle between here and Milan? No, there’ll be many more. We’ll have three mountain stages and two others, and the flat stages have been very problematic in this Giro. What climb have you labeled as the toughest in your career? And your enemy? The Zoncolan, which has no respite, I rank it over the Mortirolo and the Angliru. About the people that I’ve faced off with, Andy Schleck and Froome. What’s your opinion of Porte, who has just announced his withdrawal from the Giro. Can he win a grand tour? He’s a rider who, when he’s well, is very strong, in the TT and in the mountains. Why not in the future? It he feels well, clearly, yes. Have you definitely decided not to ride the Vuelta in 2015? First I’m thinking about the Giro. Then, about taking a break before the Tour. The Vuelta, unless something strange happens in the Tour – like a crash, or if it doesn’t go well for me – does not figure in my plans. Did you picture yourself being in such a favorable situation on the second rest day? I didn’t imagine this much advantage. I didn’t count out finishing with the maglia rosa, and I though of the mountain stages in the third week as an opportunity to take the leadership. Even though I am doing better than I thought, there’s a lot of Giro ahead. What’s making the difference between you and Aru? Is it the legs or the experience? In the time trial, the legs. But it’s been both things. I’ve ridden a lot of grand tours, paying attention to every detail. Even though he lacks a little experience, Aru is a very strong opponent who will bring a lot of joy to this sport and whom I still must mark closely. You find yourself in the final phase of your professional career. Are you competing to reap your best-ever memories? I’d like to finish my career on top. That means riding the three grand tours, and setting my sights on the victory or on conquering them. I don’t know how long I’d be able to extend my career, maybe enough, although I might not be at the highest level. The challenge of the Giro and the Tour is difficult, but one of my motivations is to leave the best legacy. Are you looking to win a stage – one that you still don’t have in your Giro palmares – or to economize strength? Getting a stage win is secondary, I can’t put the GC at risk. If I get one, great. The one goal above all others it to win the Giro. Getting a stage win would require an extra effort in the short term, and in this week, and I’d pay for it later. Considering the GC and your toughness, who will the other two on the podium be? I don’t know how everybody will perform, including me. Amador, Trofimov and König are riding very well, and then there are the two from Astana, Aru and Landa. We should wait to see their strategy as per the GC. If Landa is given the freedom, we’ll see him on the podium in Milan. Do you want to prove something, considering that they disqualified you from the race in 2011? Everybody that came to the 2011 Giro knows what they witnessed. I’m enjoying this Giro like the other two. That’s a question for Quintana, Nibali and Froome. Besides, new cyclists are always emerging. When I started it was the generation of Armstrong, Evans and Leipheimer, then the ones my age – Andy and Nibali – and now younger guys like Quintana. We’re talking about a difficult analysis. You say that Fabio Aru reminds you of you when you were 24 years old. What would you do if you were Aru to put Alberto Contador under pressure? 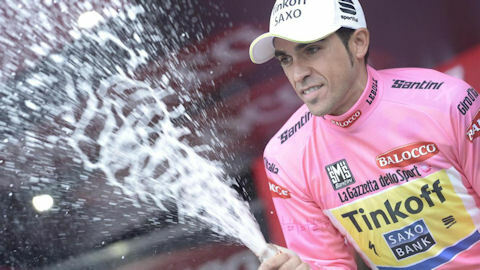 Alberto Contador rode masterfully in Stage 15, the first true high mountain stage of this Giro d'Italia. Even though he was left isolated by his team to withstand a prolonged onslaught by the Astana team, he was unruffled by Aru's thugs. He attacked cheekily at the sprint contest in Pinzolo, springing out from behind to take the bonifications while his rivals did nothing. Contador also showed grace under fire, ushering young Aru to the line, engaging him in chat, before gapping him by only one second and finishing 3rd with more bonifications. 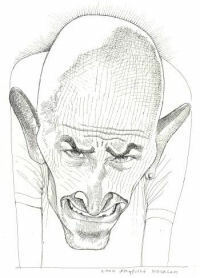 Reporters wanted to know if Alberto thought that he had earned the title that marks the master and leader of the race in a statesmanly sense: “I’m the patron of the Giro? I don’t know, I can only dedicate myself to giving the best of myself. The seconds don’t mean much. I took the bonus because it was free, and if something’s free, it’s better to take it. But the bonus wan’t an objective,” he said. Giuseppe Martinelli, manager of Astana: “Right now, Contador is practicing his profession like the patron of the race. There’s nothing to be done. We wanted to prevail on Madonna di Campiglio with Landa in order to get him as close as possible to the podium. Mikel has done a great job over two weeks and deserves his prize. Our goal is to put two guys from Astana in the photo in Milan." 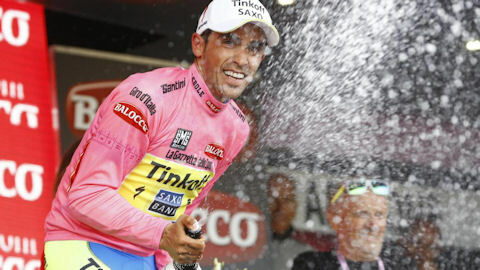 Alberto Contador recaptured the maglia rosa with an authoritative blow today in Stage 14 of the Giro d’Italia, after a crushing 59-km individual time trial under pouring skies. He finished the stage in third place, bested only by Kiryienka and Luis León Sánchez, but it was his performance against the other GC men that told the tale. Contador started strong, finished strong, and in spite of suffering, never flagged along the course. He passed his three-minute man Landa, was at all times superior to Urán, and caused Aru to hemorhage seconds for kilometers on end. Richie Porte, who put in a lukewarm performance as Contador's domestique in the 2011 Giro, failed utterly to produce a ride worthy of his status as a favorite. "Thank you, I'm really happy but my legs are killing me. 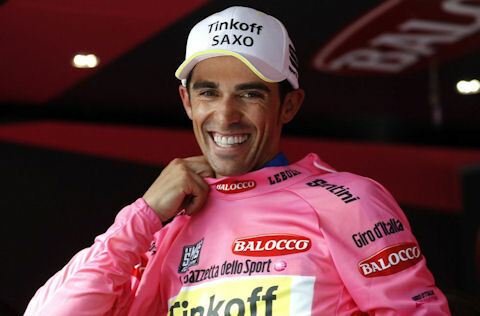 The wind changes were difficult," Contador said to reporters after the stage. “For me it was a great surprise,” he continued, after accepting his ninth maglia rosa on the podium. “I rode consistently at every moment, I felt well physically. I saw that I wasn’t going too fast in the first part, but I saw that the banners had changed direction due to the wind,” he said. “I focused on the GC, they gave me references from the very first, and I saw that they were good. I was able to catch Landa before the halfway point on the course and that helped me do a good time trial,” said the Tinkoff-Saxo leader. Will you tackle the third week like Indurain, on the defensive in the mountains after getting such a gap in the time trial? Miguel Indurain did amazing things in time trials, he was unique. The time differences that I got are important, I didn’t expect them. However, they’re going to provoke many race situations, and we’ll see how the tactics develop. It can be hard for me to hold back, and sometimes the best defense is a good attack. Does this make for a situation in which you can start to save something back going into the Tour? I can’t allow myself to think the about the Tour, I’ve got to think about the rest of the Giro instead. In Jesolo I was involved in a crash at 3.2 km to go. Even though I hardly touched the ground, I saw that my bike was no good, and I had to hustle to get another one from a teammate and limit my losses. The same thing could happen tomorrow. When these three weeks are over, then we’ll focus on the Tour. Will Fabio Aru be the opponent to watch? Aru can be a very dangerous rival in the high mountains. I’ve ridden a lot of grand tours, and I know that everybody’s legs hurt. Fabio has shown that he’s not immune to a bad day… but who’s to say he won’t have a good day tomorrow? In spite of your wariness going into the time trial, due to its length, and the discomfort that you said that you were feeling in your legs, you had a crackerjack day. You’ve always asked me about the TT, and I’ve answered that it is what is and you have to adapt to it. And since being in Stage 14 of a grand tour influences your ability to recover, it’s gone splendidly well. Although the pain in my legs was unbelievable, I gave it everything from the very start. You even put more time into specialists like Porte and Urán. I can’t say much about Richie and Rigoberto because I don’t know the final splits. How many times did you inspect the time trial course? I came to see it after the Volta, together with Basso. I did it on the bike and in the car. Yesterday I wanted to see it, but it was complicated by the crash. I couldn’t use the rollers either. At eight o’clock I did a turn on the rollers to test the leg. I went to check it out afterwards, and I recorded a video with commentary. Afterwards I went back to watch that video, did a short warm-up and then to the bicycle. Are you afraid of an offensive by Astana, and that Tinkoff-Saxo is wearing out? Each team executes its own strategies. I’m extremely happy with my team. I can only thank them. They’re the very model of professionalism. As you announced your retirement for the end of the 2016 season, does that make this your final Giro? I’m not focusing on that. This will probably be the last. I don’t know if I’ll come back, that’s why I want to enjoy every moment here. Stephen de Jongh, Tinkoff-Saxo DS: “We are really happy for the win. Alberto has done great time trials in the past and today was not an exception. He did a nice job on the flat part and on the uphill section later on he had a lot of power. After his crashes on stage 6 and on yesterday’s stage we were of course paying close attention to his knee and shoulder, but he showed without a doubt that he could manage it. In the morning on the rollers, he complained a bit about his knee but I saw he could maintain a good aerodynamic position and perform. 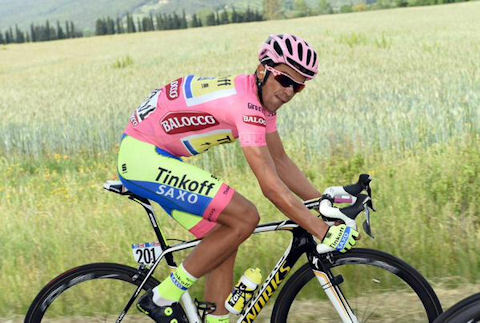 CONTADOR CAUGHT IN PILEUP, ARU IN PINK! 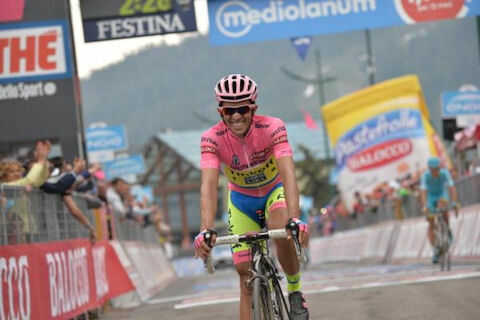 The Tinkoff-Saxo leader reached the finish line 0:40 behind Fabio Aru, who took over the maglia rosa. Aru was in front of the crash when it happened and did not wait for race leader Contador to pick himself up and return to the fight, which in cycling is considered unsportsmanlike. Aru now leads the Giro d'Italia by 0:19 over Contador. Alberto pointed out that the team had searched the last 3 km of the stage profile in advance to pinpoint the most dangerous sections, but “just at 3.2 km or so is where the crash was.” They had been riding, as usual, in relative safety near the front of the peloton. Alberto landed in a tangled nest of bikes, but rose quickly and spun around in search of a teammate. Tosatto spotted him and crossed the road diagonally, then dismounted and carried his bike to Alberto, lifting it over the wreckage. Alberto was already moving into position to mount the bike when the veteran Italian reached him. “Fortunately, Alberto's shoulder wasn't affected by the fall and we are very happy with that. His left leg was hit but tomorrow we have a very long time-trial and we can get some time back. We will see what happens but I feel confident today's incident will not be a big issue." Alberto Contador finished second and gained time on his opponents after following a late attack by Philippe Gilbert today in Stage 12 of the Giro d’Italia. Contador extended his lead over Fabio Aru by 8 seconds and added to that a 6” bonus at the line. Urán and Porte, arguably his most dangerous opponents in the upcoming long time trial, also lost a few seconds to Alberto during the treacherous, rainy stage. Contador worked hard for the extra seconds, riding within the protection of his team but striking out alone to stay safe in front on the wet roads, and always on the lookout for pitfalls and attacks. “We’re riding avoiding risks, above all, and, I think, with intelligence, watching every moment and every situation. Astana is very strong, but I do think that it’s true that we’re well-organized and in the end, it was a good day for us with this latest uphill finish,” he said. While Contador can thank his own initiative and expert squad for his success, Fabio Aru's failure to take on nutrition also apparently contributed to his time gain. Aru bonked near the end of the stage. Even though his teammate and mentor Tiralongo fought like a mastiff to prevent Contador from taking bonus seconds at the line, the young Sardinian now sits 17” behind Alberto in the GC, and cannot steal the maglia rosa by sprinting for bonifications tomorrow. Do you see yourself as the strongest person in the race? We’re riding what’s been a very competitive Giro from the first stage. Every riders is expending his strength and energy, the rain is taking its toll. Nothing’s been won yet. Your rivals have already gone on the defensive. They’re not riding defensively – maybe Richie and Urán are, because the time trial favors them, but Aru and Astana have not suspended hostilities and are in attack mode. Although I’ve been the one more on the move in these last two days. 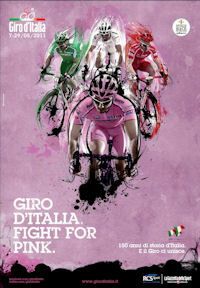 Don’t you feel like the patron of the Giro? No, I still see that as really far off, very difficult. A thousand things could happen. In what way will you tackle the time trial with that change of position that you announced? I must see what to do. Richie really has his sights set on the time trial, Urán too. The Astana riders will have to minimize their losses. In my case, Faustino will bring a bike to my room to test my position. It’s not ideal to go out without the best aerodynamics, meaning 10-15 fewer watts, but we’ll have to wait for the results. For the moment, you’ve got another 14 seconds of advantage. All of the advantage is important. On a bad day here you could lose minutes. The margins are key for playing with strategy. Aru lost time on Monte Berico. You already warned that he wasn’t feeling great at Imola. I’ve seen myself dispute grand tours many times. In these two stages, I found out that he was faltering, so I jumped. On this occasion, he didn’t have a good day and was gapped. But if you look at the route book, in the final week anything could happen. It seems that you don’t need Tinkoff, Astana has facilitated the race to this date. It turns out to be difficult to know what tactic that they wanted to use, they improvised according to the situation. If their leader has hit the wall it’s more complicated to interpret. Have you gotten over your physical issues? I think so, and my legs are still improving. There’ve been a few days in which I didn’t mention leg problems, the bruises, which really weighed me down, not just the shoulder. In a grand tour, it’s the ability to recover that really makes a difference. “It went according to our pre-stage plan and it’s of course nice that Alberto was strong enough to take some seconds on his rivals on the final climb. It was an uphill finish after a hard stage, so there were some riders who were marked on the last kilometers. Another important factor is that we avoided crashes on the wet descents, where the rain and small stones on the surface made it difficult. Everybody gets more cautious on descents like these and some are afraid to crash, so we also saw some splits”. Although young Russian rider Ilnur Zakarin was already en route to victory off the front of the breakaway – and the day’s finale was an unlikely place for gains by the GC men – Contador had reasons to try his legs. Did he attack to find safe ground in front of the pack on the descent, to test his shoulder, or to test his rivals? “There was no terrain for trying anything, but instinct was telling me that maybe some riders weren’t feeling so great, that they were pretty much on the limit, and I wanted to see,” Contador said at the finish. About the regrettable situation of rival Richie Porte, who lost 2:47 in earned loss and penalty in Stage 10, Alberto commented, “About what Richie did, it’s normal: Your heart is beating a mile a minute and the only thing that you want is to lose the least amount of time possible, you’re not thinking about the rules. There are moments in the race when it costs you to be organized, and there are situations that can complicate things. Stephen de Jongh, Contador's DS: “Again it was a hard parcours and a good breakaway group went away, while we could control the events pretty well. Some of the other teams pulled as well during the stage such as Orica, who took up the chase in the last part of the stage. However, Zakarin was very strong." “Our ambition was to protect Alberto. The rain meant that the technical parts of the stage were trickier and we had to pay more attention during the stage. In the end, Alberto improvised a little attack to test his rivals just a bit. All in all, a wet but good day and we will start focusing on tomorrow. It looks as if it’s going to rain again and with the uphill finish in Vicenza it can become tricky." 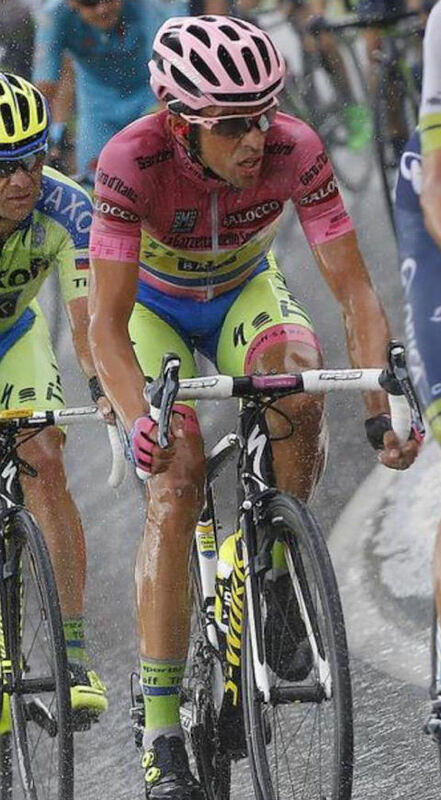 Manuele Boaro, Contador's teammate: “We were in the front throughout the day, working hard for Alberto. It was even made harder with the rain but we are happy with the outcome. 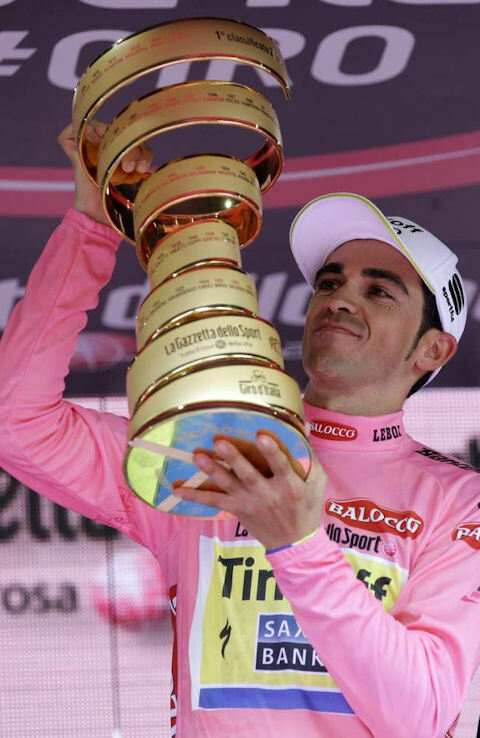 We did our job and Alberto retains the pink jersey." “For me this is a great opportunity to be in the Giro racing for such a great team and a great leader like Alberto. It will certainly be the best Giro I have ever done and I will give my best. The first week has been very tough and we had to take it one day at a time but I think we are a strong team and a well-knit squad and that is what counts”. Boem won the day by attacking in the final kilometer off the front of the day's breakaway. The group's staying power managed to foil the big sprinters, who had surely dogeared this page in the route book. The big news was that Richie Porte – 3rd in the GC at 0:22 when the day began, and a big threat for this weekend’s time trial – punctured at around six kilometers to go and was unable to catch up to the pack after changing wheels. Porte struggled to hold the wheel of the teammates who came to his rescue, and in the end lost 47” and one place in the GC. The worst for Porte, however, was yet to come. As the stage ended, photos were already circulating online of Porte, with a teammate standing nearby, accepting a wheel from Simon Clarke, a fellow Australian on Orica-GreenEdge, a rival team. According to UCI rules, it is not permitted for a rider from a rival team to lend a competitor a wheel or a bike. Porte could have accepted his teammate’s wheel or waited for one from neutral support, but it was not legal to take Clarke’s. The photos told the story, and the rule book is clear, therefore the race jury docked Porte 2:00, sending him backward in the GC to 12th place at 3:09 behind Alberto Contador. Tomorrow’s tricky stage ends at the Ferrari Autodrome, but Alberto was willing to let tomorrow take care of itself. “Tomorrow is tomorrow, I’m thinking about getting to the hotel, resting, putting my legs up, and in the morning we’ll see the route. The priority is rest,” he said. Mauro Vegni, Director of the Giro d’Italia, about the sanction of Richie Porte: “Obviously as the director of the Giro d’Italia, I have to say that I’m sorry about this because it’s a further burden for a rider who hoped to do something important at this Giro, but this doesn’t mean that he can’t still do that. But clearly there was little to be done, rules are rules, and I think rules have to be respected for the credibility of this sport and, in this case, the credibility of the Giro d’Italia. “I think it was a mistake made by the riders in absolute good faith. Perhaps if somebody had reminded them of the rules it wouldn’t have happened but that’s talking with the benefit of hindsight. Off the top of my head I can’t remember anything like it. Stephen de Jongh, Tinkoff-Saxo DS: “Today was very good, we definitely can’t complain as the sprinters’ teams took control after the break grew to above two and a half minute. Our focus was on taking care of Alberto and making sure that he remained safe in the peloton until the finish line. “It’s always hard with a fast stage right after a rest day. We had tailwind and high speed and it was hot as well. Combined with lots of roundabouts, these factors made the stage pretty nervous. So I wouldn’t say that it was comfortable for the guys today”. Alberto Contador did a light training session with his teammates today, the first rest day of the 2015 Giro d’Italia. After a little over an hour on the bike, the Tinkoff-Saxo nine went back to the hotel for lunch. Alberto put off eating, however, to stick to his schedule and do a press conference which had already been delayed by a few minutes so that he could test his position on the time trial bicycle. The first question revolved around that topic. This morning you also tested the time trial bike? Did you want to adjust anything? I took advantage of today to do a little test of my position on the bike, even though within five days I should be better. But still I’ve decided to change position and open up the handlebars a little, affecting the aerodynamics a bit in order to put less stress on the shoulder. In this case I think that it’s more important to protect it. Have you changed it only for the sake of the shoulder, or also because the final part is uphill? No, only to protect the shoulder. This time trial is absolutely all about aerodynamics. We’ve already done an average of 40 km/hour in training, and the climb is very gentle. What’s your condition like right now? Are you satisfied with your position in the GC? I’m happy because I’ve been getting better every day since the crash. Yesterday I already had a pedaling cadence much more similar to normal than on Campitello Matese. As for my situation in the GC, I’m very happy about that, too. I’m leading my rivals and they’re the ones that have to do something about it, even though it’s true that the Giro has only just begun. Aru asked you to collaborate and afterwards he sprinted. How do you analyze that situation? It was something that I more or less expected. In the final kilometer I could’ve stayed on his wheel to save strength and not lose anything, but as I said yesterday, I hope that this Giro won’t be won or lost by a one-second margin. You started the Giro with the idea of winning the double, and in the first week you crashed. Was all that going through your head then? Yes, I thought about that at the very moment of the crash. I’ve never broken my collarbone and I was afraid that that was the case, but then I grabbed my shoulder and instinctively put it back in place. Then I thought about all the sacrifices that I’ve made, and that I had mortgaged the first part of the season on the double… but it never entered my mind to go home. As I said to a friend then, if I have to go home now, I’m going to need a psychologist. Since your crash, has it been only the shoulder problem that’s limited you, or have your legs also been telling you that you’d better not push it? Since the crash, I’ve been more conservative than combative, both yesterday and on Campitello Matese. Getting through these stages without losing time was good for me, because there’s still more than enough ground ahead of us. In this case, I preferred to err on the side of caution. How did the idea of going for the double come about? Do you want to go down in history after having already won all three grand tours? For me, it’s only an extra motivation. Were I to succeed – which is really difficult – it might be more remembered, but I’m doing it only for the difficulty that it entails, as a sporting incentive. In your career, once you’ve gotten the leader’s jersey, you’ve never lost it. Have you thought about where and when you could lose it here? But if some weak point did exist, where would it happen? The jersey could be lost in any stage, as we saw the other day, but we’ll have to see what happens in the time trial, because Richie Porte is very strong there. Maybe this year this tradition won’t continue, but there’s a lot of ground left for recovering it. In any case, that’s only statistics. Hasn’t overcoming the shoulder problem given you even more motivation and desire to win? No, because it’s almost impossible to have more motivation. I’ve worked so hard for this, I’ve prepared not just physically but also mentally... We’ll just have to see if I can do it. Who looks the best of your rivals after this first week? Don’t you think that Aru has expended too much energy and that he might end up paying for it? My main rivals continue to be Aru and Porte. Richie has the time trial in his favor, but we’ll have to see how the classification shapes up after that stage. Regarding Aru, it’s true that he has expended energy, but so have the rest of us. His turf, like mine, is the mountains, so for me they’re both dangerous. This first week has been really hard, really stressful. Now, on the other hand, it seems that several transitional days are coming up, before the time trial. Are you worried about any stage between now and then? In spite of not having very tough finales, this first week has been very taxing. The peloton has suffered and now it seems that a period of true relaxation is coming, but we’ll have to be on guard every day and, above all, save every ounce of strength we can for the time trial. Are you worried about losing the jersey before the time trial? No. We did consider that possibility, of ceding it to Niemec, but as for bringing down the tempo a little, Astana went to work and nothing happened. The true objective is to win it in Milan. Until then it’s possible that the jersey could change ownership a lot. Alberto Contador was able to take the start in Stage 7 of the Giro d'Italia with his shoulder stabilized by kinesio tape. The stage was the longest in years - 264 kilometers - and there was often a headwind, but Contador was well protected by his team. He finished 30th, in a large group with the other favorites a few seconds behind stage winner Diego Ulissi. 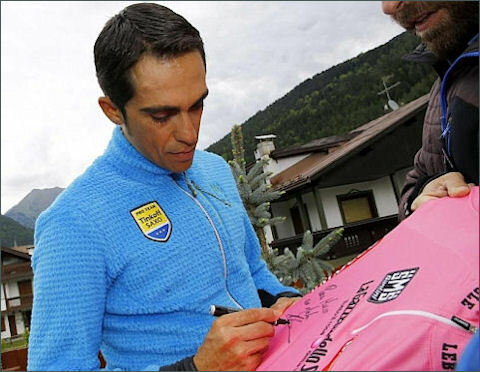 Contador remains in the maglia rosa. “I’m happy because I got through the day - something that had not been a sure thing - but on the other hand, I suffered a lot of pain. It was a windy seven-hour stage and starting at four hours in, I couldn't find a way to position my hand on the handlebar. That’s why I'm happy to have gotten through a touch-and-go moment.” said Alberto after stepping down from the podium, where today he was able to put on the maglia rosa. About tomorrow's mountainous stage with summit finish, he said, “I might err on the side of caution on a climb suitable for attacking, but the main thing is that the arm gets better. Now it's time for ice and rest." 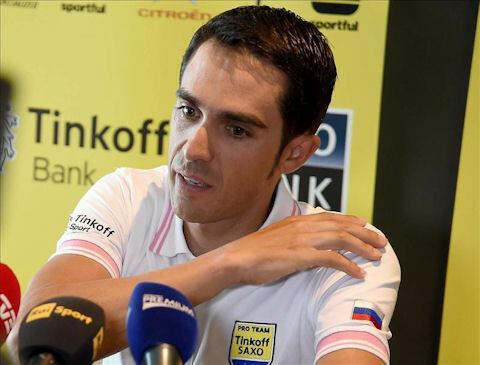 Before the stage, Contador had told reporters, "I had a good night, with analgesics, and I hope that I respond well. My morale is rising," he said, adding, "I really hope that it doesn´t rain,” in anticipation of the difficulty of putting on rain gear with restricted mobility in his left arm. 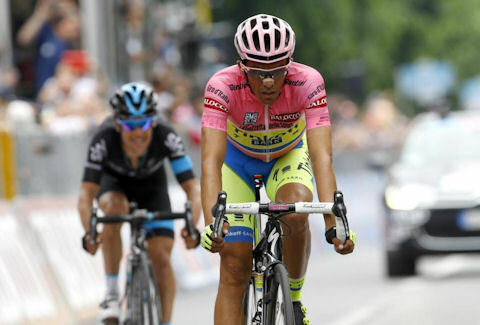 Alberto Contador hit the ground in a mass pileup in the final meters of today's Stage 6 of the Giro d'Italia. A fan on the sidelines leaned over the barrier with a long lens camera and made contact with the peloton in the final sprint. Contador was able to ride to the finish line, but disappeared immediately without talking to reporters in order to put ice on his shoulder before the podium ceremony. The anxiety level among those who follow the Giro skyrocketed when he declined to put on his new maglia rosa on the podium and did not uncork the prosecco, although this decision may have more to do with the ice pack than pain. X-rays found a temporarily dislocated shoulder, but no fractures. Alberto plans to continue in the Giro tomorrow. Doctors will have another look in the morning, and the Tinkoff-Saxo team will issue a statement at that time. The following is a translation of Alberto's comments in the video above, given after leaving the Giro's mobile medical unit. Alberto Conador: "Initially it was a dislocation. I got up and my instinct was to pop my shoulder back in. I was frightened because I thought that I’d broken my collarbone, something I've never broken in my whole life. When I was going to the podium my shoulder popped out again and I was in big pain, so we had to take the maximum precautions possible. "It seems from the exams that there's nothing more to this than a dislocation, we have to be cautious that it doesn't re-occur. I have to get through the night well, keep the shoulder immobilized, and keep my fingers crossed that it doesn't slip out again, and endure the pain. "Optimistic? We'll see, I've worked for this race so much since last winter, and I want to continue in it. We'll have to see tomorrow if I realistically can or cannot, but I hope so, yes. I'll have it bandaged to keep it as protected as possible. It won’t be very easy... but we'll see." Alberto Contador landed the first punch on his rivals today with a strong attack at 4.6 kilometers from the finish line in Stage 5 of the Giro d'Italia. The only opponents who could hit back were Aru and Porte. Swinging right and left, the three favorites fought to the finish on the summit at Abetone where, with a final swat, Aru took four bonus seconds to draw within two of Contador in the GC. Contador is the new race leader. Aru is now 2nd overall at 0:02 and Porte is 3rd at 0:20. The stage was won by Jan Polanc, followed by Sylvain Chavanel, the surviving members of the day's breakaway. At the post-stage press conference, Alberto fielded questions about maintaining the leadership, his direct rivals, and hidden motors in bikes. You’ve never taken the leadership so early in any of your other grand tours. Contador: I wasn’t thinking about attacking, honestly. I was there, at the front of the group, I looked at the other riders, I didn’t feel very well, but when I attacked I felt better. Sometimes it ends up being complicated for me to stay in the pack, so I gave it a try Even though we hadn’t planned to take the maglia, it’s a joy. Then, are you satisfied with the time differences? Yes, in the end I think that I got a nice result. Urán came unhitched, like some other dangerous cyclists. Even though Aru and Richie are very strong, I think it’s a good situation after the fifth stage. Are you modifying your intentions or those of your team’s commander-in-chief? Nothing’s changing. I didn’t expect the jersey, but having it is fantastic. It’s a fine gift and an honor. I’m very happy, because wearing this garment is incredible. We could lose it tomorrow, for example. For us, the most important thing is to be wearing pink in Milan. I love the Giro d’Italia, the people and the country, and seeing myself as leader during the next working day will be fantastic. Mario Cipollini said on the RAI program after the stage that your change of bicycle at 35 kilometers from the Abetone doesn’t benefit cycling when there’s so much speculation about the possible use of hidden motors. (Laughs sarcastically) Numerous reasons exist for carrying out a change of bike, and none of them has to do with a motor. You can play with different types of tire, one that works for 200 kilometers, and others that are good for thirty or forty. It doesn’t seem like something negative to me. On the contrary: I consider it positive that technological development exists in our sport, like in motorcycling. All these stories about motors sound like a joke to me, like science fiction. Are Aru and Porte confirmed as the rivals to beat? Yes, and at the moment Astana have proven that they’re feeling very well. Fabio and Richie are the strongest right now. Being a climber, Aru will try to take advantage of any opportunity to take time before he hits the Treviso time trial. As for Porte, the ITT favors him, so he’s looking to hold on until getting a margin there. Compared to when we were teammates, he’s much more experienced, and thinner (smiles). 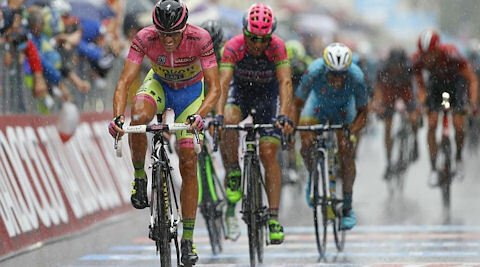 Nevertheless, the Giro has only just begun. We’ll see. Contador was well supported by his team until the final meters of today's stage, with most of the squad protecting him until well into the last 10 km, although they were not the sole pacesetters in the pack. When Alberto stopped to changebikes at about 35 km to go, teammates dispatched him to the front. At 4.6 km to go, Alberto attacked powerfully, drawing Aru and Porte from the stressed peloton as yarn is drawn from an unraveling sweater. The rival duo managed to bridge to him at 4.2 km to go. Porte attacked in the wake of a motorcycle at the 5-km banner, and was easily marked by Alberto and Aru. Aru attacked immediately afterwards, but failed to shake the others. Meanwhile,Aru's teammate Landa joined the three favorites, while up ahead surviving escapees Jan Polanc and Sylvain Chavanel rode toward the line. Landa pulled all three favorites until the final sprint for the remaining four bonus seconds while, incidentally, all kinds of ducks and parries happened at the front of the main peloton a minute behind. Aru made a play for the bonus which was matched so beautifully by Contador at his side that the two seemed to be perfectly synchronized. The Sardinian pulled slightly ahead, however, and left Alberto boxed in against the barrieron the final curve. Porte, in the end, was a hardly more than a supernumerary. Stephen de Jongh, Contador's DS: “In the meeting before the start we spoke about that we should avoid letting a big breakaway go. Instead we could see an interest in a smaller group that wouldn’t be dangerous in the GC. "Orica took responsibility and controlled much of the stage, while we remained focused on protecting Alberto. In the end, he took the decision to attack, as he knew that he had to drop Chaves in order to take the jersey. He managed to do so, while many GC contenders lost time. I’m pleased with the team’s performance and the guys remain focused on our overall objective."